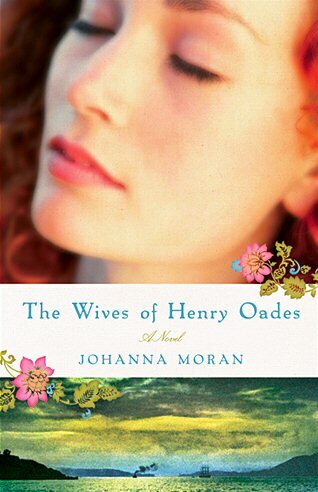 Random House Reader’s Circle sat down with Johanna Moran to chat about the story behind the story of The Wives of Henry Oades. 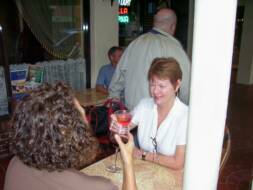 It was a breezy summer day in downtown Sarasota, Florida, and they each enjoyed a glass of wine at a café, just around the corner from Johanna’s home. Random House Reader’s Circle: When I first heard the premise of your novel, it struck me as such a fascinating and unusual story that I thought there must be a family connection here. And indeed there is, though not the sort I would have guessed at. How did you come to write The Wives of Henry Oades? 1. On the voyage to New Zealand, Mrs. Randolph, a fellow passenger, cares for Margaret as she miscarries. Later, when Margaret tries to explain her grief over her new friend’s death to Henry, she thinks, “the small transactions between women, particularly mothers, cannot adequately be explained to a man. Some, like hers with Mrs. Randolph, will bind women for life.” Do you agree with Margaret? Can a strong relationship between women be forged in a matter of hours? With whom have you felt this connection? 2. Why do you think Mr. Oades misidentified Mim Bell as his wife? How could he have made such a grievous error? 3. Margaret refers to the quid pro quo of her faith: “One takes communion every single Sunday for thirty- odd years. One humbles herself, embraces every last dogmatic note, and no good comes of it, no help when one needs it most.” Nancy, too, feels as though she has been cheated. Have people’s expectations of contemporary Christianity changed? death here. Margaret never once considered setting her children free to be slaves.” She refuses to allow her children to live the life before them, planning, instead, for the life she hopes they will claim. Why does Margaret remain so steadfast during their captivity? 5. Henry finally accepts that his loved ones are dead, and eventually he marries another woman. What is the catalyst for this turning point? Do you agree with his actions? 6. Why do Margaret and the children receive such a chilly welcome when they finally return to the village from the Maori camp? 8. At what point do Margaret and Nancy start to get along? What sparks their friendship? which woman do you most identify? children and writing never did mesh. My mother squirreled the abstract away, perhaps thinking she’d get to it eventually. She gave it to me about ten years ago. I was drawn in immediately and went from there. Fascinatingly, I’ve since learned from an Oades family descendant that the case, which was reported on in the New York Times and made its way into several legal texts, including Readings in American Legal History (1949)—70 plus years later!—may actually have been a hoax. There’s some debate about whether the story was in fact invented by a California newspaper as a way for them to illustrate a loophole in the law that would have permitted bigamy. RHRC: What in particular about the abstract drew you in? Did you and your mother discuss the narrative at all while you were writing? JM: Well, I considered my own marriage. It’s my first, but it’s my husband’s second. How outraged would I have been in Margaret’s shoes? (She who didn’t want to leave England in the first place.) My mother, two sisters, and I have discussed the narrative at length, from both women’s perspective and from Henry’s, never arriving at a perfect solution. RHRC: What aspect of the story did you find most challenging to fictionalize? JM: The greatest challenge was knowing Henry. I regularly interviewed my husband and other men. “Don’t tell me what you think I want to hear,” I’d say. “Tell me what you’d really do/say under these circumstances.” Of course, no two men had the same answer. I came away with a mix of responses. My Henry Oades is a bit of a composite. I like and respect him. I also feel sorry for him at times. RHRC: One of the things that’s so compelling about your novel is how sympathetic the three main characters are: The reader can relate to each of them and understand their predicament and the choices they make— even if we don’t always agree with them. While you were writing the novel, who did you feel most connected to or sympathetic toward— Margaret, Henry, or Nancy? JM: Easily, Margaret. She’s endured the most and is more entitled to Henry than Nancy. But then that’s one first wife talking about another. Others will surely feel differently. RHRC: How do you think the three Oadeses would have fared today? RHRC: There was a scene that didn’t make it into the final draft— one in which Henry gives Nancy and Margaret a rather unusual gift, and it takes the women a bit of getting used to. Tell us about the earth closet and where that idea came from. JM: I laugh thinking about that scene. I came across the earth closet in my reading. It was essentially a human litter box, consisting of a commode, pail, and dirt. Its popularity was very short lived. In the original draft, when an earthquake destroys their outdoor privy, Henry surprises the women with this indoor contraption. Nancy is particularly horrified. American women took some time getting used to the idea of any sort of indoor toilet. The “necessary” was associated with germs and disease, and naturally belonged outside. RHRC: The Wives of Henry Oades seems like quite a wonderful tribute to a wide swath of your family— writers and lawyers. And in your previous career you traveled extensively, didn’t you? with my husband, John— for whom, in Margaret’s or Nancy’s situation, I would have fought tooth and nail. RHRC: Had you been to any or all of the three locations the novel takes place in (London, England; Wellington, New Zealand; Berkeley, California) before you began writing? Did you visit afterward? Do you think your travel experience helped you create vivid portraits of each city? JM: My husband and I visited all of the settings in the novel before I began writing. So, yes, actually being in a place is a huge help in creating a visual. We’ve been back to England and California since. We walked down Polk Street where Dr. McTeague’s dental parlor is located. And we ate at the Cliff House and drank champagne at the Palace Hotel, though not as much as Margaret and Nancy did that day. RHRC: Of the places you’ve traveled, where has been your favorite and why? JM: For natural grandeur— hands down: New Zealand, particularly South Island. It is a spectacular country, and the people are lovely. An Air New Zealand pilot invited us to dinner simply because we were new to the place. I’d love to go back. And I will always hold San Francisco dear. John and I honeymooned there. It is one of the most romantic cities in the country. RHRC: Can you tell us a little about what you are working on now? JM: I’m working on a story about a friendship between two nineteenth-century prostitutes, one of whom was in fact murdered by Abraham Rothschild.